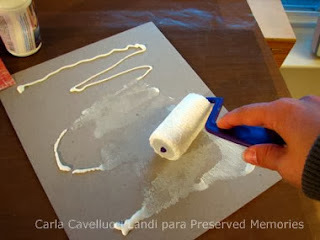 I found this very cute idea in Carla's blog and I HAD to share it with you all!! In December we tend to want to have gifts to give our friends, family, some teachers... I think this would be great! Enjoy!! a piece of chipboard or boardbook measuring 8 1/2" x 10 1/2"
2 patterned paper (mine are from Magnolia Paper pad, from My Mind's Eye) measuring 9" x 11"
Glue the patterned paper, work on the surface with a bone folder or a soft cloth while the glue is drying and trim the excess of the paper on the sides, sanding if necessary. Do the same on the other side if you want (you can do this later, as a finish). 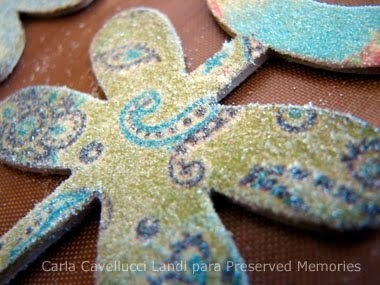 Decorate as you wish, just paying attention on not using any bulk material: punched paper e stamps work better. I used the Fiskars Apron Lace punch on the bottom and McGill's Fancy Square on top. I also apllied some Distress Ink on borders. 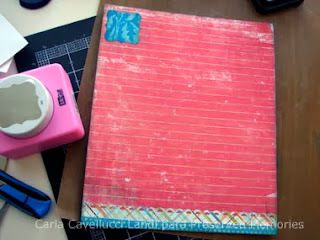 Now cut and apply the plastic adhesive on top of your patterned paper. Take extra care with bubbles. A bone folder or a soft cloth can help on that while you are applying the adhesive. 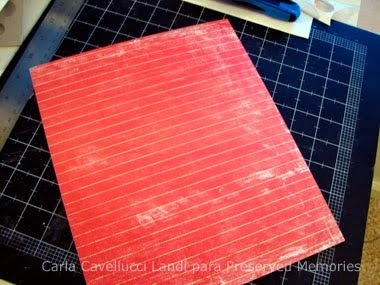 Leave extra adhesive to fold and finish on the back of your project (as you usually do when bookbinding). 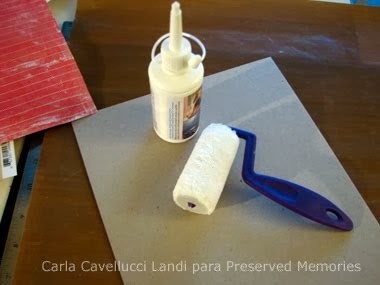 Now you can apply paper and adhesive on the back, just to have a nice finish on your project. 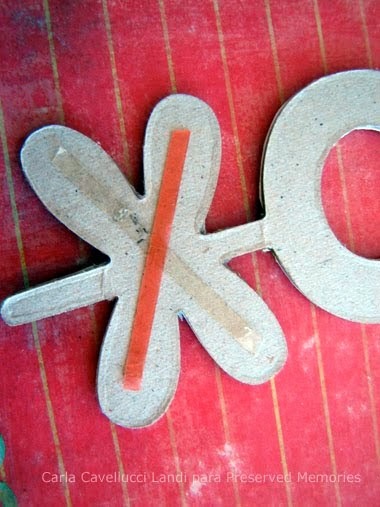 Cut excess from both paper and adhesive, not leaving any excess to be folded. Now you can apply dimensional details, like Thickers letters. 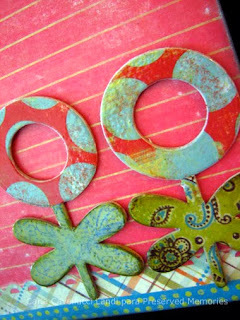 Decorate some chipboard elements with paper, trimming and sanding the excess. 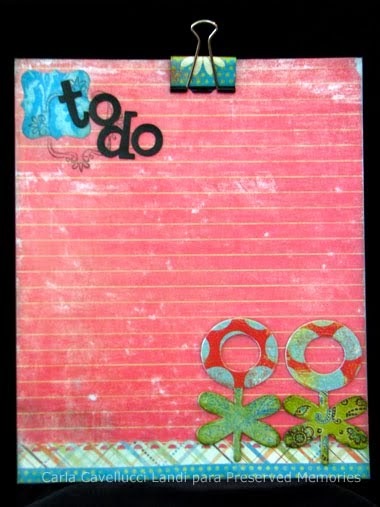 Tap Embossing Inkpads on top of the elements and apply clear embossing powder. 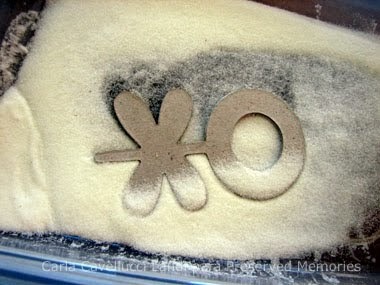 Apply the heat gun to melt the powder. Note that I'm working on a craft sheet, it protects your surface from the heat. 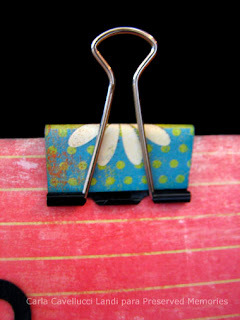 With a scrap of paper and tacky tape I decorated the binder clip. Attach the elements on the bottom of your clipboard and the binder clip on top. Your clipboard is ready! Aplique os enfeites e coloque o binder clip na parte de cima da sua prancheta. Ela esta pronta! The plastic adhesive surface allows to write and erase with white board pens. That's why you only put tacky tape on the bottom of the chipboard element: the top holds small messages. 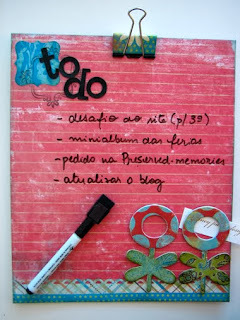 You can also attach some magnets so you can leave your clipboard on your refrigerator or metal board, if you want. My neighbor saw this project and loved it so much I'm planning making one for her as a Xmas gift! Check them out and come back here to leave the picture of what you made. We would love to see the different things you will create using your cricut! Hello again!! It has been a pretty hectic week for me and I am thrilled to be back here... I have had several conversations with those of you that own the Cricut and you have mentioned an interest in being able to purchase the Gypsy at Scrapbooks & Stuff. So, we are considering to offer it via pre-orders. Before we do so, we would like to hear from you. Please leave a comment telling us if you are one of the one's interested in purchasing one. If indeed we decide to offer it, it will probably range between 320.00 and 350.00. Besides this I was wondering if you have a favorite new line. Many of the companies are having new releases and we are trying to decide which ones to bring. We want to make sure we bring in what you are dying to have, so please leave us a comment with the lines that you are interested in. Our interest is that of better serving our customers, so use this opportunity to voice your opinion. We are listening! In the past I have had many of you approach me by asking the following question: "How do I get that torn paper effect on my pages?" I have been able to show some of you this technique, but thought it would be appropriate to have it posted here so that those of you that are beginning would feel a bit more comfortable with this technique. I came across this video and though it was pretty good and easy to follow. Enjoy! Oh my gosh Vanessa & Nana..................that is so awesome about the SCRAP PINK!!! I just made a mini album this past Saturday and it's a Breast Cancer one.........check it out on my blog... I made a video of it. Thank you Teri for sharing! Hope to see you at the store during the weekend! I have been doing a lot of research and I still can say confidently that one of my favorite designers is Irene Tan. She has an awesome blog where she posts all sorts of tutorials. I decided to include one of my favorite one's here. 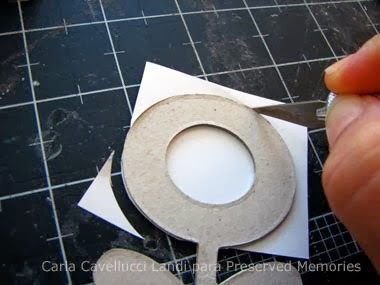 The neat thing about her tutorials is that they are simple and you can apply the techniques she describes using whatever materials you desire. Make sure to visit her blog to see more of her work! Enjoy!! I've promised to share the tutorial on this layout. So here it is. 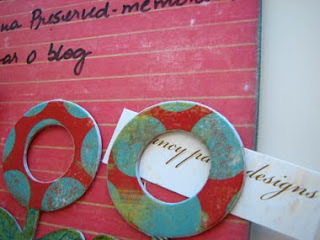 1) Use a die cut paper to trace the scallop circle shape onto the pattern paper and cut it out. Ink it's edges with distress ink and add some dots of liquid pearls on each scallop. Use this piece as the base for this layout. 2) Cut out a huge circle from a beige cardstock and distress it's edges using a scissors. Ink it with distress ink. Add it to the base of this layout. Hand stitch around the edges. 3) Use some leaves and branches masking template from Heidi Swapp and distress ink to create some masking in the middle of the layout. Later us the "Water Distressing" technique on it. 4) Cut out a rectangular piece from another pattern paper and distress it's edges. Ink it with distress ink and add it to the right of the layout. Hand stitch around it. 5) Cut out another smaller piece of rectangular from another pattern paper and distress it's edges. Ink it with distress ink and add it slightly to the left on top of the earlier piece. 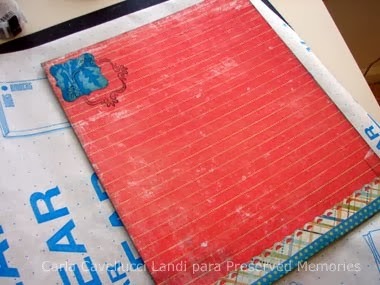 6) Add a strip of felt border on the bottom of the page and hand stitch on both it's upper and bottom edges. 7) Add the photograph in the middle of the layout. 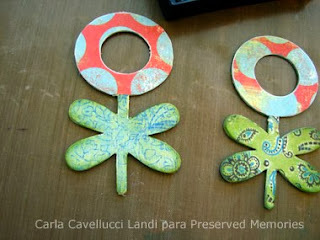 To create the distressed frame, firstly, cut out a frame from a bare thin chipboard. 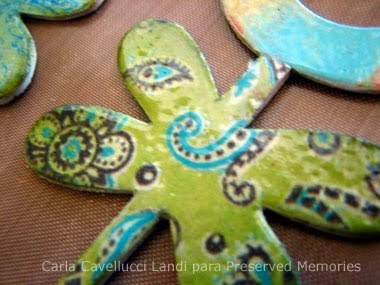 Paint it with Crackle Paint and later ink it with distress ink. Later, simply just use some white gesso and a brush to swipe around it. 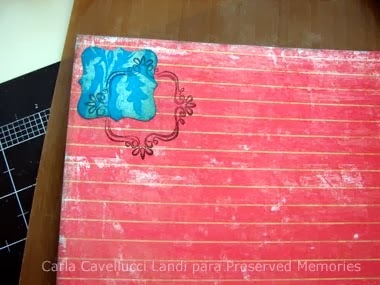 Add it on top of the photograph and later add a strip of lace on the bottom of it. Tie a charm to it too. 8) Get a tag and ink it's edges with distress ink. Sew a button and tie a ribbon to it. Add it to the left of the page with it's right edges, slightly insert underneath the frame. 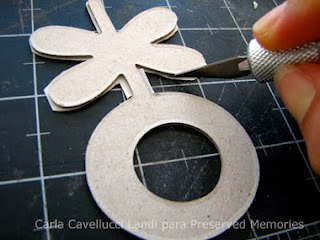 9) Cut out some leaves, branches and flowers from the pattern papers and add it all over the page. 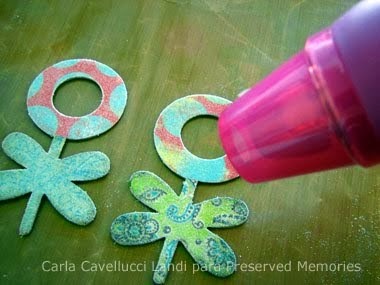 decorate the huge flowers with liquid pearls and pearl adhesives. Also randomly add some small red felt flowers and add a small pearl in the center of each flower. 10) Add a metal butterfly on the top of the layout. 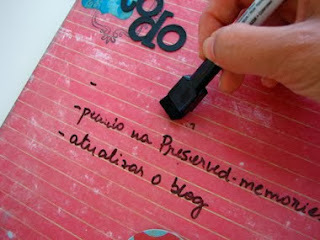 11) Write the title on the pattern paper and cut it out in squares. Ink it's edges. Cut out some squares from a black cardstock and add it underneath the title. Use some foam adhesives to add the title on top of the cardstock for dimensions. After this tutorial, I think most of you would agree with me that it's really simple and easy to create this layout. Remember if you want to play along using my sketch, check it out here. Sources: Cardstock: Bazzill; Pattern Papers: Jillibean Soup; Inks: Ranger Distress Ink; Others: Ranger Crackle Paint, Heidi Swapp mask, Folkart Gesso, Ranger Liquid Pearls, Kaisercrafts pearls adhesives, Blueyedezines Fetalicious Felt, Jillibean Soup tag and felt flowers, lace, thin chipboard, metal butterfly, button, ribbon, floss for stitching, Glue Dots, Zip Dry and other adhesives. I love using this cool technique with wide ribbon. 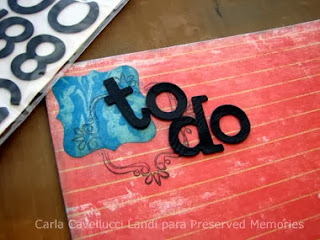 Cut the ends in a notch, mount it down, and then place chunky sticker letters right over the ribbon. It sort of anchors the letters in place, and of course, it's another fun thing to do with ribbon. What did we do before ribbon?? Thanks Amy for coming in and showing me your acrylic pregnancy album yesterday! I love the way you dressed up the pregnant lady die cut with a vellum skirt. You really did a great job commemorating that special time in your life. Have YOU tried a clear acrylic album yet? We have quite a few styles in stock, and we are even offering a class later this month, with a New York City theme!